Tucked away from the bright lights and noise of the Siegel Center crowd is a room packed floor-to-ceiling with Nike products and equipment. That little room is equipment manager Kris Kullman’s playground. Kullman arrived to Richmond about six months ago from Shippensburg, Pennsylvania, where he was the head football equipment manager at Division II Shippensburg University. His responsibilities at VCU include outfitting all 15 sports teams from head-to-toe, ordering new gear and doing laundry, among other tasks. 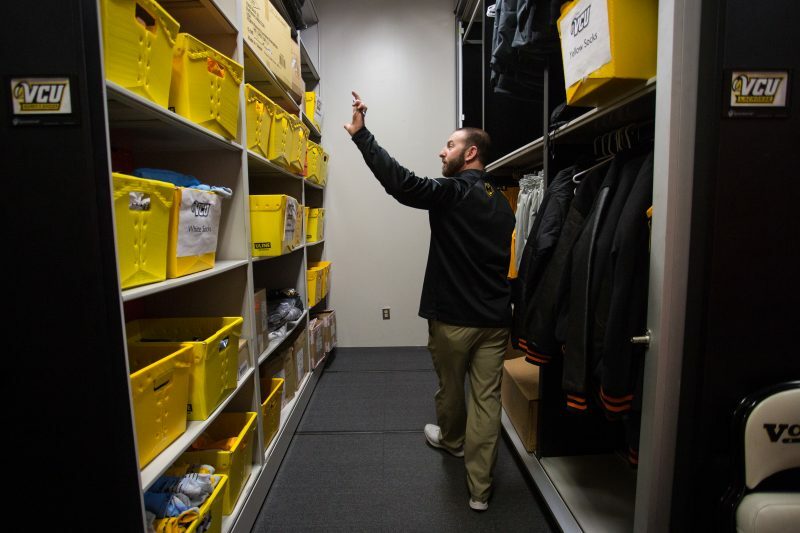 The fall season proves to be a hectic time in the equipment room because a bulk of the Black and Gold teams are in season. VCU hosted the Atlantic 10 Volleyball Championships Nov. 16-18 and Kullman had a little more work and laundry added to his normal workload on a typical weekend. He remained on-site for all three days of the tournament, changing the towels on the benches, stocking the locker rooms and doing laundry for the Rams and one of the visiting teams. Kullman attends every Men’s Basketball game, but much of his job is done before tipoff. Once the uniforms are washed and dried, they are put on hangers. This allows Kullman to easily set up the locker room on gameday with one of the steps already done in advance — he said the setup process takes about 20-30 minutes. Another duty Kullman takes on as collegiate equipment manager is designing uniforms, which he did for the first time with the Rams this year. Kullman’s favorite jersey was a fan favorite a year ago on the court at the Siegel Center, which made a return to the floor this season after receiving the A-10 patch on its collar. The Men’s Basketball team wore the gold alternate jerseys Nov. 24 against Hofstra for the first time this season. 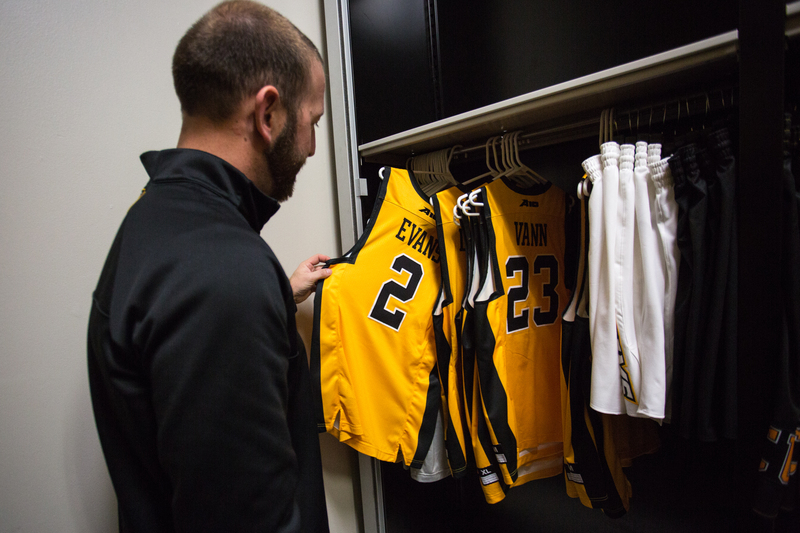 This season, Men’s Basketball will wear four different uniforms — the home white; away black; gold jerseys and the newest addition to the lineup, an all-gray outfit with the Ram logo on the chest. 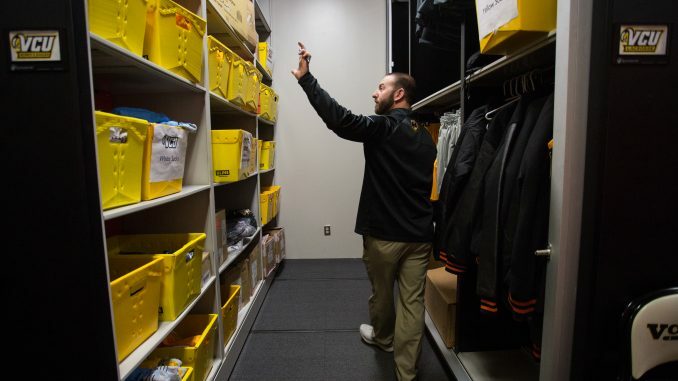 The job is not for everyone, but Kullman enjoys it even if it means handling sweaty clothes after a game in the laundry room across the hallway from his office at the Siegel Center.